The Future of Your Neighborhood: Who Decides? is a series of monthly workshops that discuss how members of the public can actively engage in neighborhood development. The objective of this series is to inform New Yorkers about strategies for self-organizing to enact positive change in their neighborhoods and in the city as a whole. 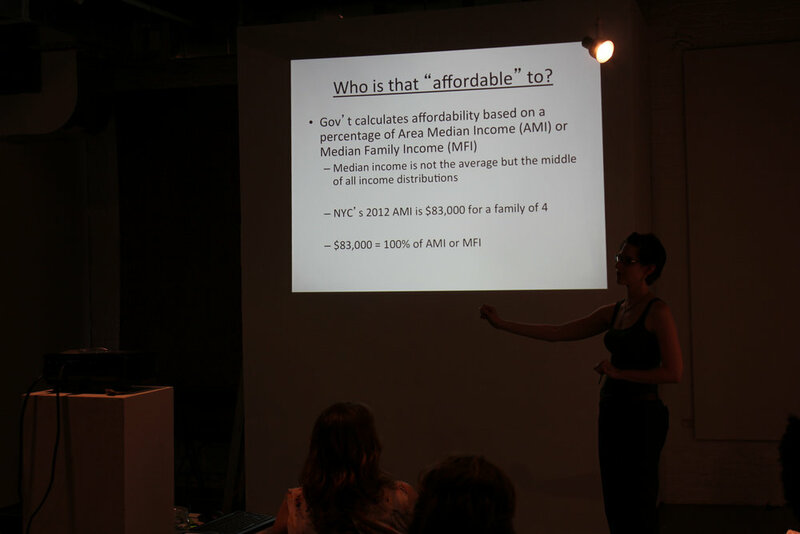 The program kicked off on May 16, 2013 with the workshop Affordable Housing: How Do We Get What We Need? Have you ever wondered just what “affordable” housing is, anyway? Or how you can get involved in bringing more affordable housing to your neighborhood? Jackie Moynahan of the north Brooklyn-based advocacy group Neighbors Allied for Good Growth (NAG) helped audience members navigate the complexities of New York City housing, and explained how to become an effective advocate for better affordable housing options. In conjunction with Flux Factory’s June 2012 exhibition, Bionic Garden, we presented Reclaiming Vacant Land for Community Use with Paula Z. Segal of 596 Acres. In this visioning session Segal explained New York City’s land use and real estate warehousing practices, described where you can find information on that vacant lot in your neighborhood, and shared success stories of communities gaining access to previously close-off parcels of public land. Audience members learned how to find that special lot in your life, where to go from there, and what to do with it. The July workshop focused on Newtown Creek: one of the most polluted industrial sites in America, bordering Flux Factory’s Long Island City neighborhood. Eric Sanderson of the Mannahatta Project shared historical research he’s collected on the Superfund site, with the aim of making information available to artists, designers, city planners, and other interested parties for widespread use in restoring its original splendor. Kate Zidar, Executive Director of Newtown Creek Alliance, presented information on the current state of the creek, including how community members can participate in materializing visions for its future. Our August workshop highlighted four projects currently underway in Queens that were getting everyday people involved in shaping streets and public spaces to make them more walkable, bikeable, safer, and generally more livable. Moderator Helen Ho of POW! People on Wheels discussed this new group’s efforts to expand the face of cycling advocacy to include women, minorities, and delivery cyclists. 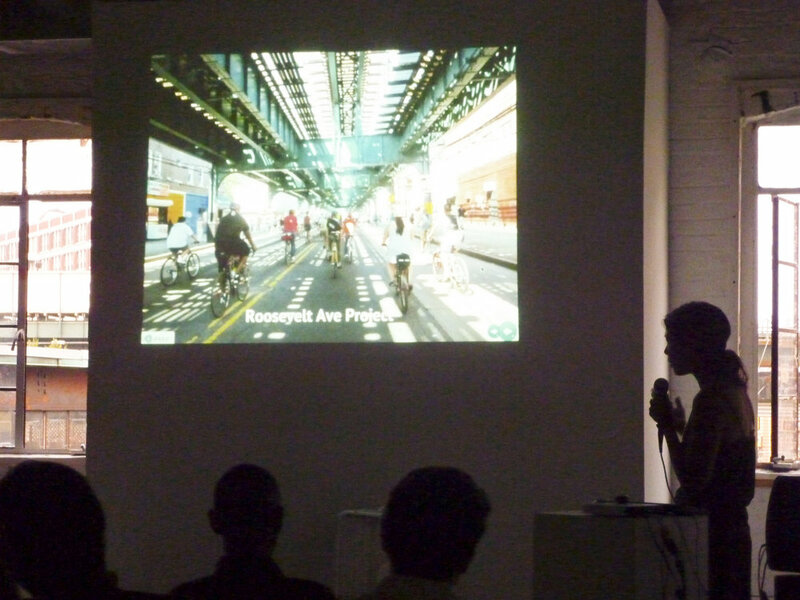 Donovan Finn presented a successful community-based effort to create a car-free space on a Jackson Heights street. Prerana Reddy of Queens Museum of Art discussed efforts to develop a community input process for transforming a Corona intersection into a DOT plaza. Members of the QueensWay Project presented their efforts to create a “Queens High Line” on an abandoned LIRR track in Southern Queens. The presentations were followed by a provocative discussion about the future of livable streets advocacy in this often-overlooked borough, and the benefits and challenges of including diverse populations in the planning process. For the fifth installment in October, we navigated the ins and outs of local government. What in the world is a District Leader? Who is my State Senator and what does he/she do? Why should I vote in New York instead of my home state? More importantly, why should I care about any of this? Lincoln Restler, outgoing Democratic District Leader from the 50th Assembly District, spoke about local government in New York, who is responsible for what kinds of decisions, and most crucially, why it’s important to vote local.